CTS-México’s recommendations are expected to increase the neighborhood’s demand for public transportation, biking and walking. Image by CTS-México. The Center for Sustainable Transport in Mexico (CTS-México) is nominated as a finalist for an online competition, “Sustainable Urban Housing: Collaborating for Liveable and Inclusive Cities,” hosted by Ashoka Changemakers and funded by The Rockefeller Foundation. Other partners include the U.S. Department of Housing and Urban Development, the U.S. Department of State, and the American Planning Association. CTS-México’s finalist entry, “Transforming the low-income housing development paradigm,” focuses on a planned development in the mid-sized city of Aguascalientes, Mexico. (CTS-México is a member of the EMBARQ Network, the producer of this blog.) 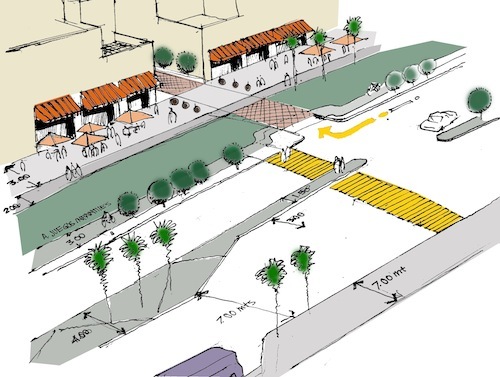 CTS-México recommended new designs that promote mixed land use to create closer proximity to city services, improve conditions for pedestrians and cyclists, and provide connections to high-quality public transportation. Specifically, the project recommends adding more commercial lots, public spaces and bike lanes, as well as increasing density and widening sidewalks to discourage sprawl and prevent road fatalities. Other finalists in the competition include ideas for water and sanitation in slums, renewable materials for housing, and earthquake-resistant buildings in Haiti. You have until April 6 to vote for your favorite project! See the list of finalists here. The competition was launched in anticipation of the 2012 Summits of the Americas, which convenes government officials to discuss policy issues, and President Obama’s Energy and Climate Partnership for the Americas. It focuses on improving the quality of life for the urbanized and marginalized communities of Latin America and the Caribbean. In light of rapid urbanization and the decline of living standards in cities as a result of overpopulation, the Changemakers competition aims to promote ideas for adequate, inclusive, energy-efficient and sustainable housing. Other important considerations include land use, community planning, housing finance, community involvement and public policy. “The competition especially seeks to identify solutions that respond to communities’ needs, work with the existing infrastructure, respect local, indigenous culture, materials, and practice, and can be applied to a wide range of locations,” the Welcome Letter states. John C. Reinhardt, the program manager at the American Institute of Certified Planners, the certificate-granting, professional branch of the American Planning Association, provides guidance on how to make the best selection among the competition entries. He identifies three defining themes: scalability, the level of integration between interdisciplinary fields, and the strength in partnership between the non-governmental organizations, public and private sectors. For Reinhardt’s complete guidelines on how to select a winning project, click here. EMBARQ is not the only World Resources Institute program that has been involved in a Changemakers competition. New Ventures, WRI’s center for environmental entrepreneurship, also entered a Changemakers competition, known as the G20 SME Finance Challenge, to come up with solutions to unlocking large-scale private financing for small and medium enterprises.